The structure, (apart from the increased clearspan) is a development of the Rudi Enos Design, Valhalla 'Tensile 1' portable membrane structure which holds the Guinness world record as the 'worlds largest portable event venue'. 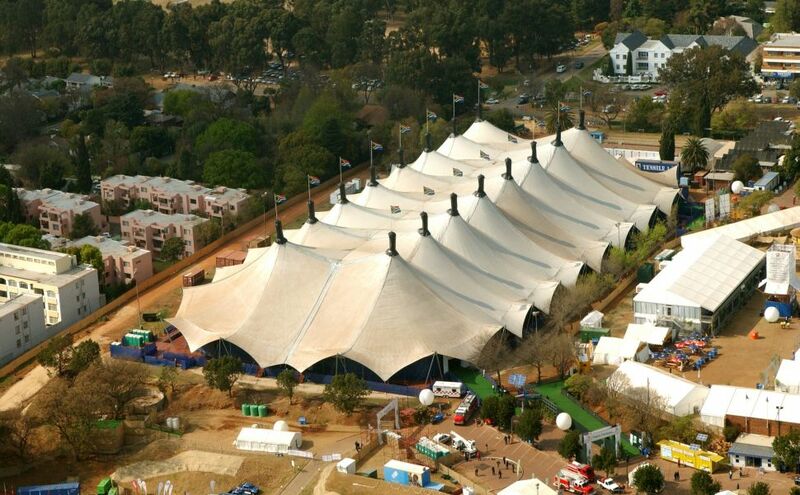 This amazing structure has proved the concept of using tension fabric roofed structures for world class events such as MTV Europe Awards, Roma 2004, Victoria's Secret Fashion Show in New York, 2001 and the Earth Summit, Johannesburg 2002, plus many, many other world class events. The structure houses events in an identical way to a permanent arena and can accommodate typical touring shows and rigging setups with up to 88,000 kilograms of suspended loads. Many of the proven design and manufacturing details of this incedible 4 acre structure have been incorporated into the P Span Arena. See www.rudienosdesign.com.